Traffic congestion has increased dramatically in India. Congestion and the associated slow urban mobility can have a huge adverse impact on both the quality of life and the economy. How congested are Indian cities compared to cities in the US? What does the future hold? Our understanding of the underlying reasons for congestion is still evolving. A popular view is that urbanization leads to ever larger cities and increased rates of motorization. These two features eventually lead to a complete gridlock and congestion. However, economic growth also brings about better travel infrastructure, which facilitates uncongested mobility and increases the pace of urban mobility. Indian cities have experienced both these trends. These changes are taking place at a much faster pace in India than in the UK and the US. Transportation investments constitute the largest component of lending of many global development institutions. A deeper understanding of the interactions between urbanization, urban mobility and congestion will help improve investments in transport and city competitiveness. Data on urban transportation in India is scarce. 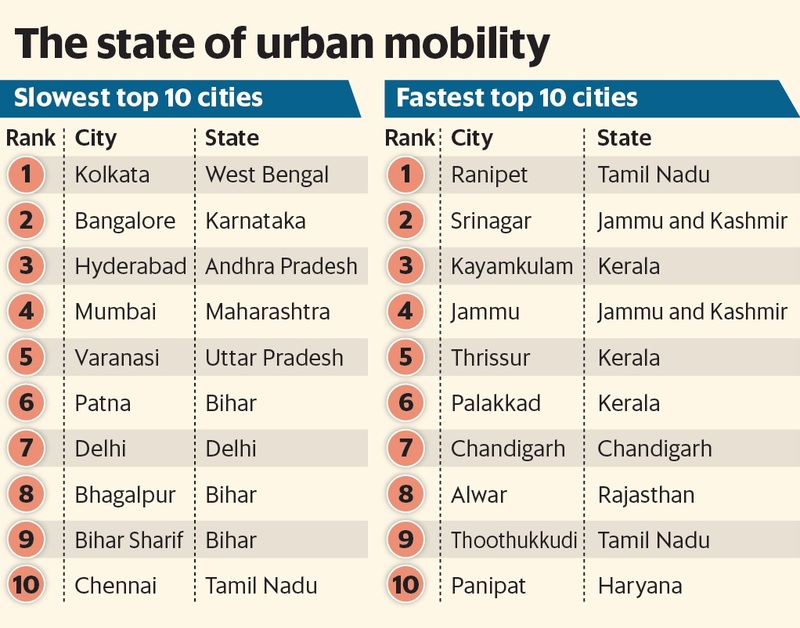 Hard data shows that mobility is slow in most Indian cities. It is slow even outside the peak hours of traffic, and in both large and small cities. India’s mean travel speed across cities is just 24.4 km per hour, much slower than the mean travel speed of 38.5 km per hour in metropolitan cities in the US. There are also big differences in mobility across cities in India. A factor of nearly two separates the fastest and slowest cities. These differences are driven by the differences in uncongested mobility, and not by differences in how congested they are. Time does make some difference to urban mobility and congestion. The slowest periods in the evening are more than 25% slower than the fastest in the middle of the night. The multi-purpose nature of urban transport also impacts urban mobility in India. Roads in cities are multi-purpose public goods, used by various classes of motorized and non-motorized vehicles to travel and park, as well as a wide variety of other users such as street-sellers, children playing and animals. Non-transportation uses of the roadway do slow down motorized vehicles. Slow urban mobility in India is primarily due to cities being slow all the time, rather than congested at peak hours. However, congestion is not a nationwide problem. It is concentrated near the centre of the largest Indian cities. Given their importance to the Indian economy, these areas with the highest levels of congestion, such as the city centres of Kolkota and Bengaluru, should be the focus of policy efforts to alleviate congestion. Indian cities do not experience the familiar twin peak congestion pattern experienced in the UK and the US, due to morning and evening commutes. There is almost no distinct morning peak; instead, there is a slow buildup of congestion that often persists until late into the evening. These unique patterns are consistent with Indian roads being multi-purpose public goods that serve a wide variety of use other than motorized transport that slow down travel. The unique Indian travel patterns imply that country-specific and city-level policies are necessary. Standard policy recommendations such as congestion pricing or other types of travel restrictions may do little to improve mobility. Instead, potentially costly travel infrastructure investments may be the only way to improve uncongested mobility. Better uncongested mobility generally correlates with the process of faster economic growth. More primary roads and regular grid patterns are associated with faster urban mobility. Investment in urban transport also plays an important role in influencing property prices. Land value taxes have huge potential to scale up urban mobility as well as maximize finance for development. Each city is unique and will need a wide array of services to fit within the existing transportation network, while at the same time leaving enough room for future evolution. This is why we need to take a local, responsible approach to co-creating solutions that fit each location.